The giveaway has ended and we have a winner! Congratulations! Tiffany’s Diamond Dogs (aka Cattle Aussies). 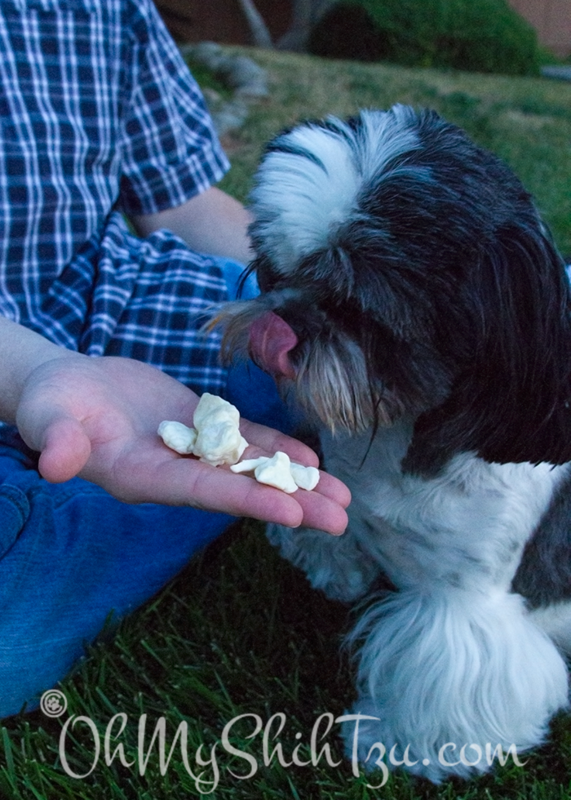 I have a love for cheese curds, and now my Tzus can also experience the wonderful deliciousness of Whole Life Cheddar Cheese Curds! I came across Whole Life a couple of weeks ago when I attended SuperZoo in Las Vegas. At the booth, John the founder of Whole Life explained to me that the products were sourced from the USA with complete disclosure of the farmers in which all their products came from. Basically a farm to table philosophy. Wow! That immediately caught my attention. So I had to know more about their treats. What I found out was that the treats are all single ingredient, that’s all! Just one thing! As I looked at the bowls of treats, one caught my eye. The freeze-dried fresh, Pure Cheddar Cheese. I immediately picked one up and smelled it. Yup, it was a cheese curd. Then John said that I could eat it… well you know what happened next. Yup, plopped right into my mouth. It was delicious! I was sure Riley was going to love it and she DID! All of which are single ingredients. The treats are made in small batches with nothing artificial. No chemicals, no preservatives, no additives, no fillers and no allergens. This is what feeding healthy treats is all about! I don’t just give my girls any treats. The back of that bag that J is reading is very important. For us being sourced and manufactured in the USA is of utmost importance to us. In addition, we want our girls to eat the best there is for them and Whole Life completely fits what we believe in. I want to invite you to check out Whole Life and their wonderful line of treats! And then come back and follow the widget below, as Whole Life is providing one of our readers a chance to win 3 Bags of Whole Life Treats! 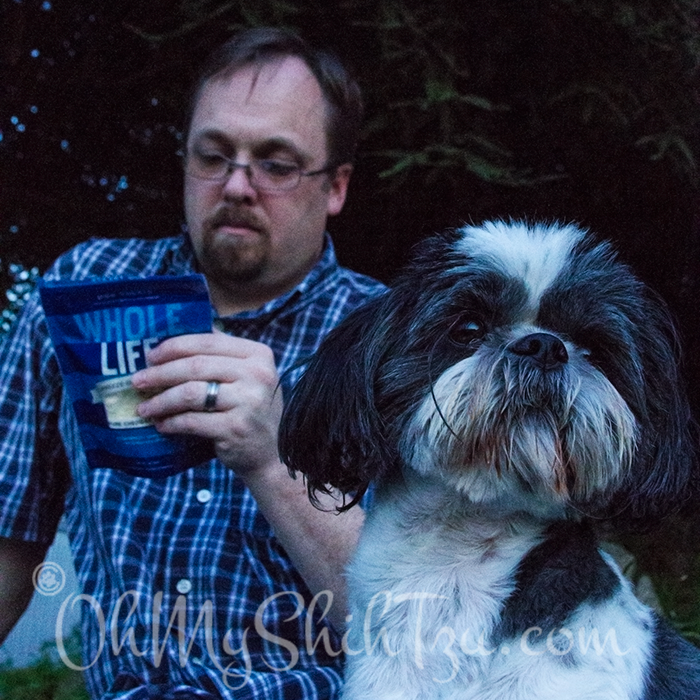 Disclosure: Whole Life provided Oh My Shih Tzu with a bag of Cheddar Cheese Curds for review purposes. Oh My Shih Tzu was not compensated for this review post. Oh My Shih Tzu only shares information we feel is relevant to our readers and their dogs. 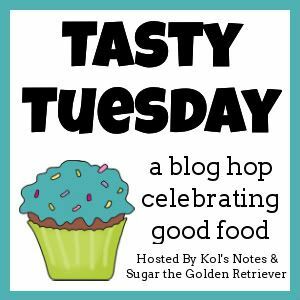 We are happy to be joining the Tasty Tuesday Blog Hop hosted by Kol’s Notes & Sugar The Golden Retriever! 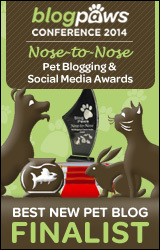 Be sure to check them out along with all the other wonderful bloggers participating today! Being from Wisconsin my girls LOVE fresh cheese curds so I’m sure they would love to try the cheese curd treats as well. Chicken, chicken liver and cheddar cheese curds would work for my super allergic pups. Cheese curd is one of my FAVOURITE foods and I bet Koly & Fe would be WILD over it. My dogs would love the turkey, venison and cod flavors. Mr. N isn’t picky when it comes to meats but I think he’d like the venison, salmon and the cheese. These sound super yummy and I’m sure my Pups would love them all! I would probably choose chicken, beef, and cheddar for them though. Great review and contest! Rachel Sheppard recently posted…Medical Monday: Is Hemophilia A the most common inherited bleeding disorder in dogs? I know!! it’s the most wonderful thing in the world! I doubt Bella, Terra, & Kronos would be picky with any of these flavors! (and Bella can be picky about her human foods that she likes to share with me 😉 lol) They would probably love them all, but especially the Chicken and Beef Liver flavors and the Cheddar Cheese Curds. Thanks for the offer. We’d be interested in Cheddar, Beef, and Chicken. Rita is super picky – except when it comes to meat, cheese and fish. I’m sure she’d LOVE the cheese curds and also any of the rest of it – probably the two liver flavors, or maybe one liver, one salmon! Jackie Bouchard recently posted…Join Us Wed. for the Last #GiveCancerThePaw Hop! Stella would love the Cheese Curds, Chicken & Beef flavored treats. Thanks so much for the chance!! I love Whole Life, my pups are particularly fond of the fish flavors! Yum! I think that my little Luna would love the Chicken, Beef, and Lamb treats. Aw man. I LOVE cheese curds. Can’t buy there here in Tulsa. OM NOM NOM. Sounds yummy! Your shihtzu is adorable! My dogs can be at the other end of the house, yet still know if we’ve reached for a package of cheese. lol They would love these! Great review! My mom loves cheese more than a mouse, so I would be afraid she might actually eat these herself! That is pretty cool, that they have cheese curds for dogs! Toby and Sushi would love the Beef, Salmon and Chicken flavors. Thank you! !